I’m giving a SHOUT-OUT to my friend MARYAN MYRES SHUMWAY this morning. I first met her when she was a missionary, and we became friends. Many of you reading this know I’m not the best at keeping in touch. Maryan is a remarkable woman, an exceptionally kind and generous soul. She has spread love all over the world (literally!). She served with other welfare services missionaries in a refugee camp in Thailand, and since then she has made friends with individuals and families “here and there and EVERYWHERE.” This morning I noticed that she’d included me in a note saying there was something I might like. MIGHT??? It has moved me so deeply that I have to share it with any of you who are reading this and want an incredible experience. You go to Maryan’s Facebook page (she’s the Maryan Shumway living in Doha, Qatar) and scroll down to 10 March. Click on the place where she shares a celebration of women on International Women’s Day. You may find that the music to “Small World” begins to invade your mind, while Maryan’s pictures and commentary will fill your heart to overflowing. 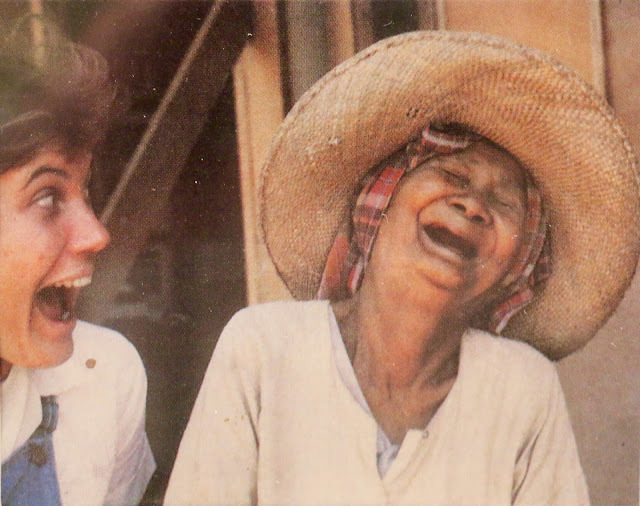 You may find yourself shedding some tears as you meet some of the remarkable women she “highlights.” One of my favorite pictures one which was taken while she was working in the camp in Thailand. We put this picture in the book Something Extraordinary, celebrating the Sesquicentennial of Relief Society. Wow! I am touched beyond words, MEE. Honestly, your words, examples, stories, experiences have propelled me all these years. I have been busy in the last almost 30 years raising six kids, the last having autism. But I have tried in a small way to integrate and build Zion wherever we have lived. How I love you! How you tutored and moved me in a time when I needed to navigate which directions to go. You have moved thousands upon thousands of people for decades. I can still picture you teaching me before I went to Taiwan, way back in 1980. I LOVED the MTC, just LOVED it. And you were one of the major reasons why. Love you. Thanks for your unusually kind words of tribute. I will try to live up to them. Hope you got my “MEE-Mail” reply! Let’s do it! Love this. Love Mar. We were roommates at BYU our senior years after studying together in Jerusalem. She will have a special spot in heaven.